If you’ve been following the Nokia N97 reviews, you will have noticed large contrasts in opinion about it. Whilst opinions on the software are understandably much more subjective, the physical hardware should be less so. 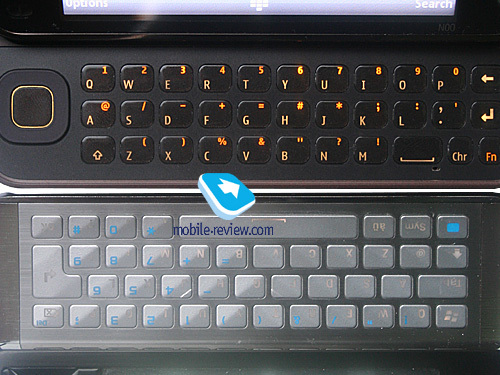 Nevertheless, there are still comments about how the keyboard on the N97 has virtually no tactile feedback (e.g. BGR and more recently, Gizmodo) yet from the likes of Mobile-Review and Engadget, receive slight praises on the tactile response of the keys. So why the mixed bag of reviews? Who’s right about the tactile feedback of the keyboard? Are some just overly harsh? Do others just have less expectations? Perhaps the answer is that they are all right. I’m not sure if it’s just an issue with the white Nokia N97 or the fact that it’s from WOMWorld to trial, but if I based my opinions on the keyboard on that particular N97 alone, I would have had to tell you that the feel is slightly disappointing. Some keys have good tacticle feedback, other keys it’s non existent. This makes it an issue when typing as you aren’t sure you’ve pressed certain keys (though after nearly two weeks I’ve gotten used to it). The keys felt really nice to use. They all had great tactile feedback; you could feel the obvious bounce in the keys that sometimes doesn’t happen with my trial N97. Also, the keyboard felt like it had a velvet/rubber coating, similar to the D-Pad, whereas on the trial N97, the keys just have a smooth plastic finish. The former is preferable for me. Finally, the slide mechanism. There were noticable differences here too – with the trial N97 having a slightly softer opening and closing, whereas another N97 felt slightly snappier. I’m not sure if it’s an issue with the particular N97 I’m using, or if it’s an issue with the white N97s or if batches of N97s have differing built quality. Being either of the latter two would explain the contrasting opinions of major reviewers on the keyboard. The D-pad is quick to absorb any stains. Mine’s turning slightly creamy yellow with a few dark ink stains. Dust/dirt is getting trapped on the bezel. Whilst this would be an issue for the black N97 too, it would be less noticeable. The white paint behind the rim of the N97s screen has started to peel, and scratches off extremely easily. At first I thought there was some dark dirt so I tried cleaning it, only to realise that I was inadvertently removing the paint and exposing a darker surface. It may just be my eyes, but the back of the N97 is turning slightly yellower too. And it’s also holding on to darker ink staining. It’s not because it’s white, it’s the materials used for the back. Any stains that happen on the face of the N97 are quickly wiped off and forgotten, but you’ll have to be a lot more careful with the back. I can’t get this to show in camera so no pics included. This last point isn’t really an issue, I’m just being pedantic about build quality now. Note the two tone key lighting. On some keys, you can see where blue plastic has been inserted to separate the secondary key. Makes me wonder if it was a last minute fix of the ghastly orange keys we saw in Proto N97s. Again, not really a problem (nor the slight light leakage), and not that noticeable; just being pedantic.